Circuit Rider CZ: Broumov rocks! I awoke very early in Náchod after dreaming of being hunted by a pack of wolves. As I prepared for departure after breakfast, a Czech-English wedding party set off in a cavalcade from the hotel car park. I was in Poland in a matter of minutes, travelling along the Masaryk Circuit (Masarykův okruh), a cycle trail named after Tomáš Garrigue Masaryk, the first President of Czechoslovakia, who holidayed in this area in 1903. I passed through the centre of Kudowa-Zdrój, a bustling spa town, and continued along the main road into Table Mountains National Park. The climb to Karłów was long and winding, but fortunately also smooth and fairly gentle. The sky was very overcast and there were spots of rain in the air, but not enough to make me significantly wet. I stopped at the top to photograph the sandstone buttresses that encircle Szczeliniec Wielki then descended into Radków, where I turned left into the wind and back into the Czech Republic. I was now in the Broumov salient, a protrusion of Czech territory surrounded on three sides by Poland. I cycled north, admiring to my left the Broumov Cliffs (Broumovské stěny), a long forested ridge forming part of the water divide between the North Sea and the Baltic Sea. It was strange to think that the rain starting to fall on me here would drain into a different sea to that coming down on the other side of the outcrop. I arrived in the town of Broumov at lunchtime. On the way in I stopped at the Church of the Virgin Mary, which dates back to the 12th century, making it the oldest wooden church in the Czech Republic. It is said to have been founded by a pagan maiden. To mark her conversion to Christianity she wove a wreath entwined with her own hair. Whoever mocked the wreath would soon be visited by a ghost and mercilessly punished. In the centre of Broumov I briefly visited the town’s rather fine Baroque monastery then lunched at Hotel Praha on the main square. The restaurant was busy and after a while a man and woman asked if they could join me at the table (as is the custom in Czech pubs). At first I assumed they were a couple, but it turned out they worked for a Czech TV station. I eavesdropped as they talked about a difficult interview they had just done with a stuttering local mayor. This - along with the occasional thud of a small child falling off a chair - kept me occupied as I waiting over an hour for a bowl of mediocre spaghetti to arrive. I set off from Broumov into rain and a strong headwind. I had been intending to do a longish detour to the top of the ridge, but given the adverse conditions and the lunchtime delay I decided to take the easier option and head straight for Teplice nad Metují. It turned out to be a good call, as the following three days were to be much tougher than I expected. Adršpach-Teplice is famous for its towering and densely packed rock formations. There are various tourist trails running through the labyrinth, but unfortunately most of them are off limits to cyclists. If I’d had more time I would have stashed the bike at the railway station and explored the area in more detail. In the event I had to be satisfied with skirting around the edge of it. Still, I always like to have a reason to return. Heavy rain the previous night had caused a mass migration of slugs across the highway on the climb out of Adršpach. During the day the traffic had pulped the creatures into a disgusting gastropodous goo which I now had to ride through. Yuck! With evening approaching I hit the final descent of the day. The first section was great fun, with lots of hairpins to negotiate. The run into Trutnov was easier and provided a relaxing end to my ride. It was only 5 pm when I arrived, so instead of heading straight to the guesthouse I treated myself to coffee and an excellent strudel on the town’s main square and watched the world go by for a while. I arrived at Ambrose Moloney’s - an Irish bar and B&B - just into time to see Alberto Contador beat Andy Schleck in the final time trial of the Tour de France. The barman told me I was the first cyclist ever to stay there, but he found a good place for me to store my bike under the stairs. After my usual evening routine of unpacking and cleaning up I went down to the bar for fish and chips and a Guinness. After dinner I took a stroll around the historical centre of Trutnov. A knight called Albrecht of Trautenberg is said to have killed a dragon in the deep forest surrounding the town in the early 11th century. 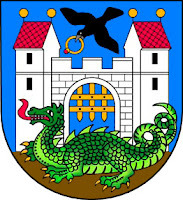 The beast features in Trutnov’s coat of arms and can even be seen hanging from the clock tower of the town hall. My true motive for exploring the town, however, was to track down the local beer Krakonoš, named after the mythical protector of the nearby Giant Mountains. I was on the point of giving up when I stumbled upon a newly opened pub serving it. To be honest it was a tad too caramely for my taste, but at just 18 crowns for half a litre I wasn’t complaining.